You remember all of the neat and functional ideas we had about the things you can do with your extra Corian® scraps, right? Well, it doesn’t end there. Over the years Corian® has been designed and created into high quality, classy designs that continue to increase the value of your home. Not only can you create brilliant Corian® designs to fit your unique needs in the kitchen, but there are plentiful ideas for the bathroom as well. Many accessories made from Corian® are designed to make life easier, providing sleek design and Arizona Countertop Repair and Refinishing has been maintaining Corian® products and countertops for over thirty years. Corian® countertop repair in Gilbert is a specialty. Why not use the beautiful material we’ve been ranting and raving about to solve your shower product problems? One option is a recessed shower caddy. Fitting within the already designed shower, this recessed shower accessory is convenient and extremely easy to clean. Corian® doesn’t hold on to germs (fantastic). Using such a malleable and usable material gives designers, contractors and even architects the chance to get creative. Many of the Corian® designs we see in bathrooms are a range of different soap dish designs, recessed and corner-shelf shower caddies and sleek toilet paper holders. The cleaner the bathroom look, the easier it is to personalize! Not to mention, towel bars and hooks made from Corian® are not only elegant and classy, but they are incredibly strong so there is no need to stress about ending up with a giant hole in your wall. Everyone loves a lazy susan. They are convenient no-need- to-ask-for-the- salt-because- it-spins susan that sits conveniently on any counter or table. Like we mentioned above, clean up is such a breeze that using Corian® (and not just for your amazing new countertops!) in your kitchen is among designers best friend’s Paper towel holders, cutting boards, spill catchers (insert technical word for those fantastic inventions here), and hot plates are all easy to build, helpful to have and look stellar made from Corian® material. Down to the cabinet knobs or drawer pulls that accent your cupboards – Corian® can add value and class to any kitchen design or remodel. Corian® would turn your old stools into a fresh and welcoming breakfast nook with some simple saw work and refinishing. There, we came up with your weekend project! 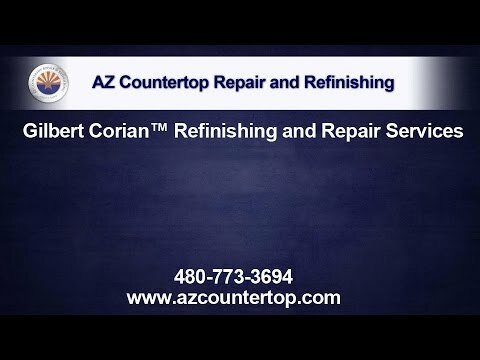 At Arizona Countertop Repair and Refinishing we are dedicated to providing our clients with the best Corian® countertop repair we can. Call us today!